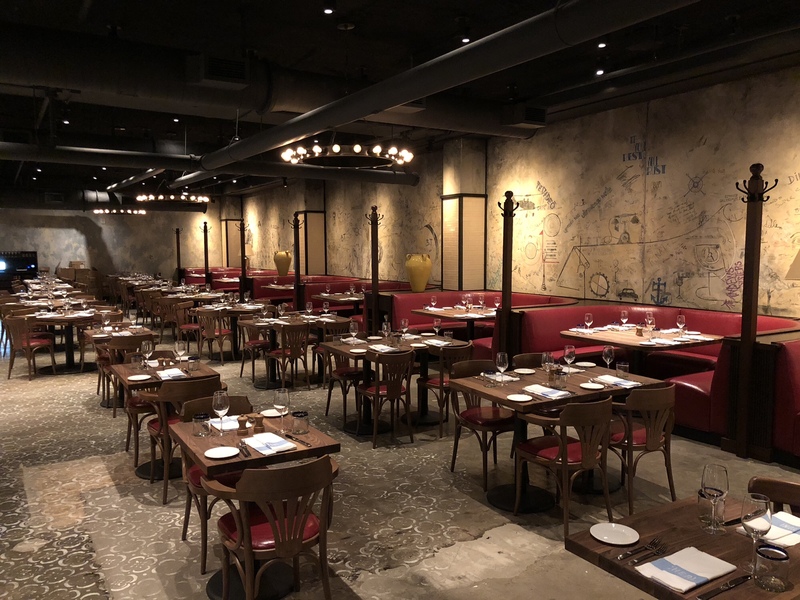 Enzo’s Hideaway Tunnel Bar Restaurant was probably one of my most anticipated venues at the new Patina Group complex at Disney Springs. 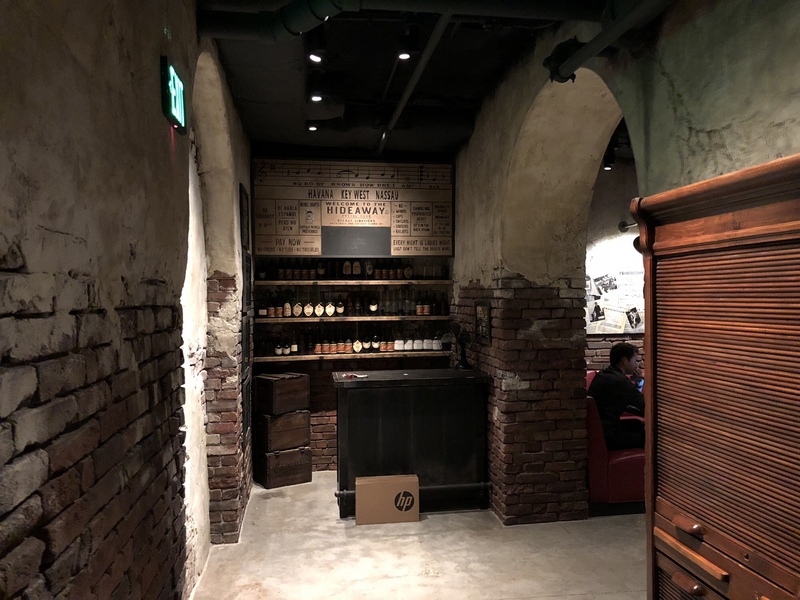 The idea of a hidden rumrunners tunnel bar (that actually was underground) was a fun, unique idea. Unfortunately, our first experience didn’t live up to the excitement we had for the venue. From the outside, it’s about as hidden as a business trying to make money can be. Sure, it’s not completely hidden like a rumrunner tunnel might want to be, but it can’t be, for practical reasons. I actually think there might be more signage added in the future to try to direct people’s attention towards the unmarked door that leads into the venue. I love this entrance. The door is perfectly unmarked and unassuming. So far, so good. Once inside, you’ll find a host stand and single hallway without much else to see. Perfectly on theme for a tunnel. 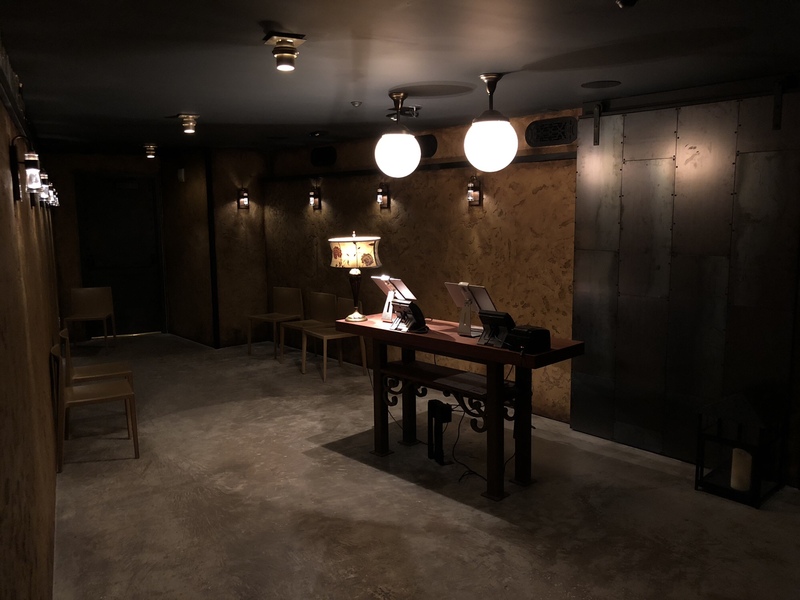 As you make your way further into the venue, it opens up to what ends up being more of a restaurant than a tunnel bar. I would have loved for there to have been more tunnels/hallways with a single table than the open floor plan that dominates 85% of the venue. I think Patina Group could have been a bit more ambitious here. There are a handful of tables set into the wall as you enter (seen below). 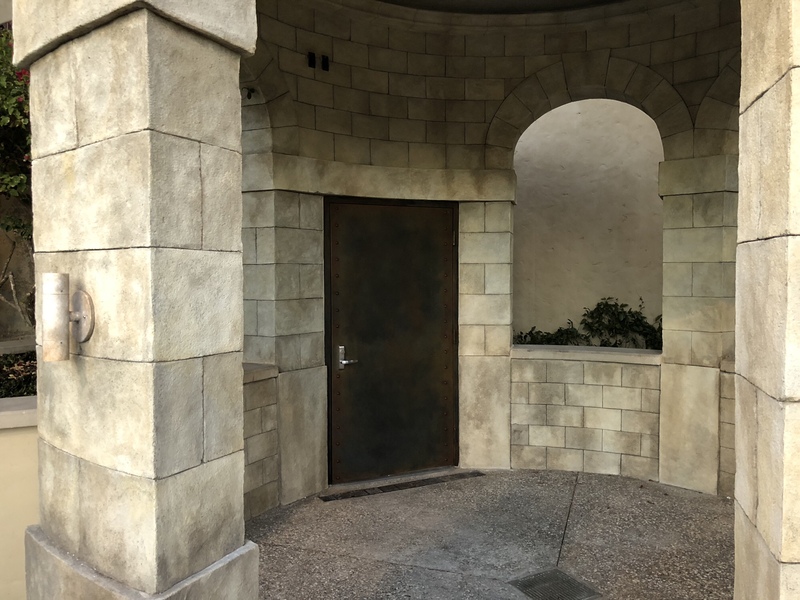 I would have loved it if they could have carried that out throughout the venue, maybe creating different themed areas as you progress through the tunnels towards the secret entrance to The Edison. With The Edison and Maria and Enzo’s nearby, there really isn’t a need for yet another restaurant. A missed opportunity here in my opinion. There are definitely some nice elements, but I give the theming a 6/10. 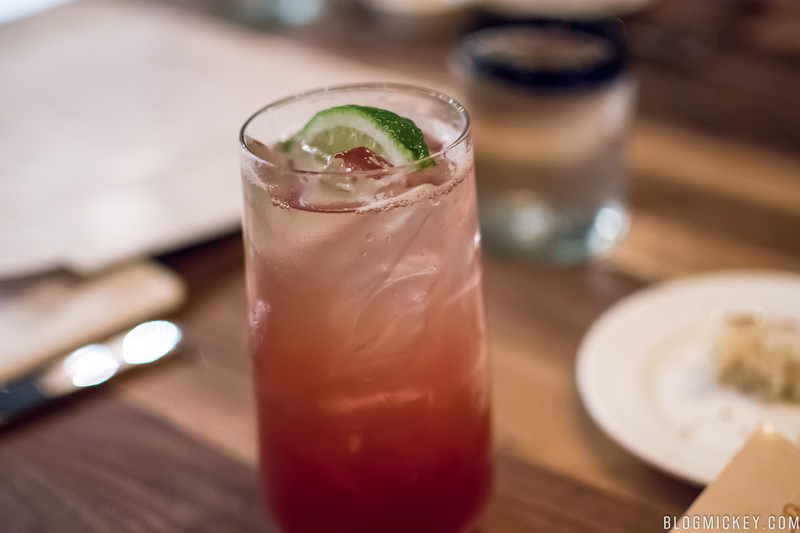 As a former rumrunner tunnel, we assume that the drinks will be some of the best we can find at Disney Springs. Unfortunately, that wasn’t the case. 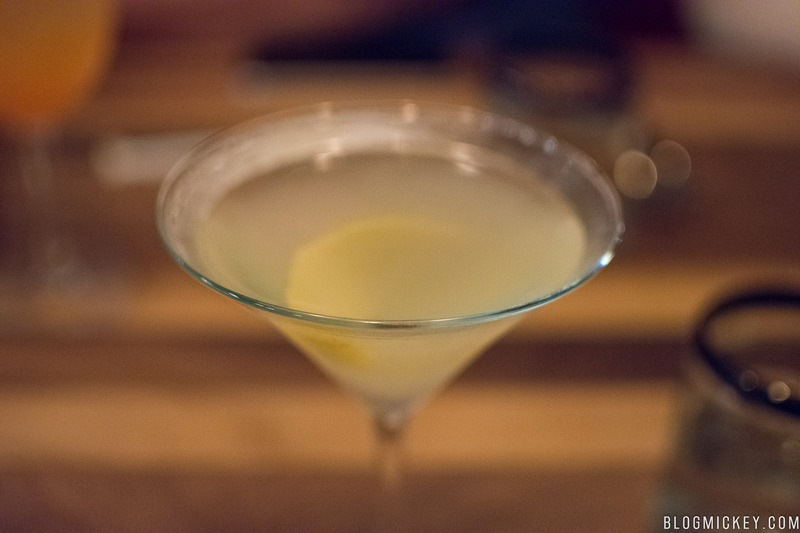 Only one drink really stood out to us, and it was for the wrong reasons. 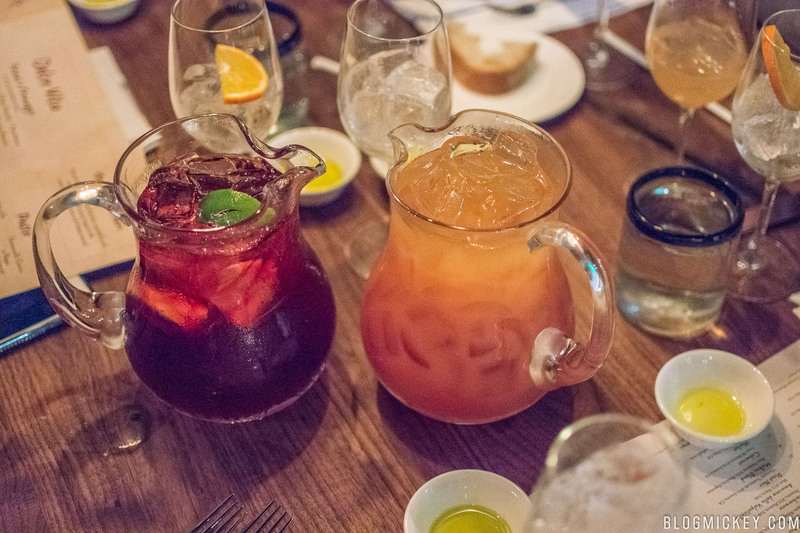 We ordered the sangria in two different forms, by glass and by the pitcher. If you were to order it, I would suggest it via glass as it proved to be watered down way too much in the pitcher. 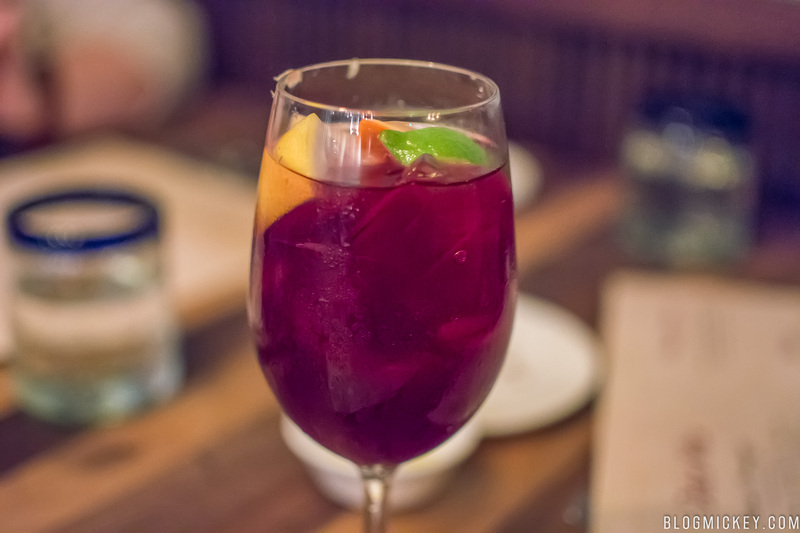 As far as the sangria itself was concerned, it was a decent sangria. No notably strong flavors, but nothing completely wrong either. This is the drink that stood out to us for the wrong reason. Two guests in our party ordered the drink and we ended up getting 4 versions of it. The first glass that arrived to the table was wonderful. It was refreshing, crisp, and flavorful. We were able to note the strawberry throughout and it was assisted by a cucumber. Unfortunately, we didn’t get a photo of the first drink, as we assumed we’d get the same drink the second time around. 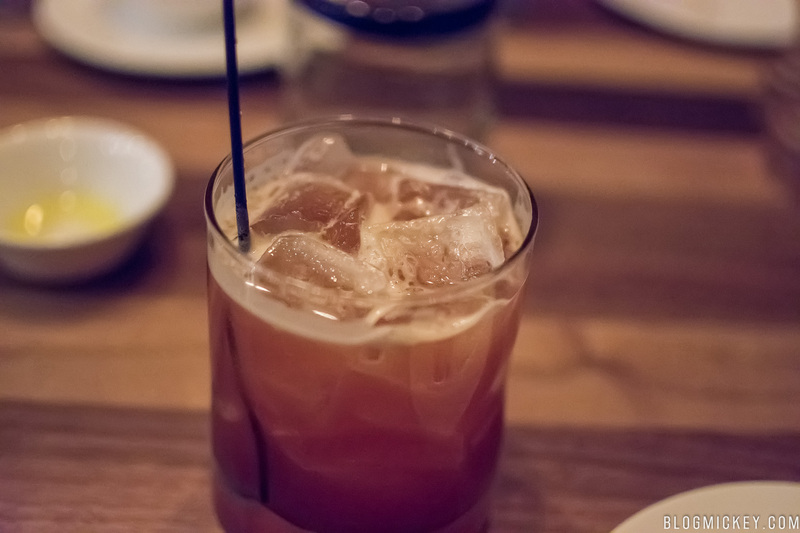 The next drink to arrive at the table (pictured below) was bitter and very far removed from the original drink presented to the table. The waiter was happy to exchange this version for the correct drink. Unfortunately, the next drink to show up to the table was just a derivative of the incorrect drink he just took back. Finally, the manager got involved and personally made the drink. It was still off in taste and nowhere near the wonderful first version of the drink. We were exhausted sending back the same drink over and over again, so we decided to keep this version. 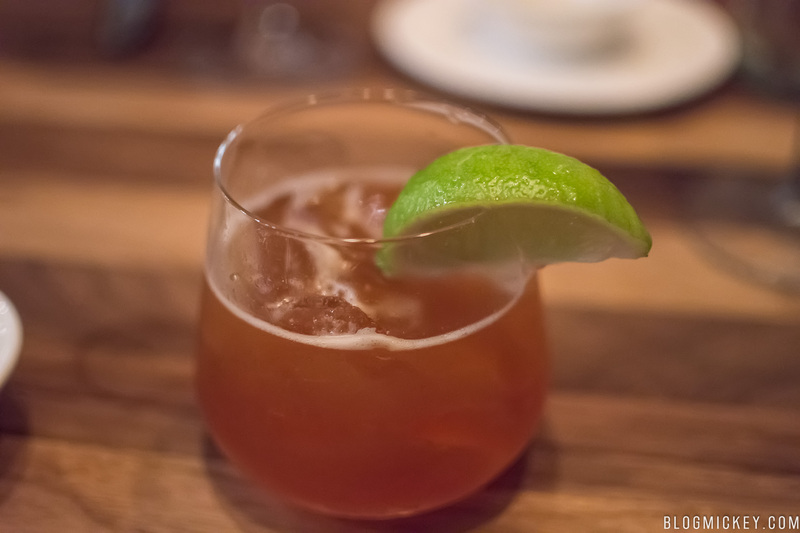 After a manager makes a drink, we assume that it’s the correct version and longed for the original drink served. Here’s a look at the final version delivered, with a lime instead of the advertised cucumber (which the original, correct drink had). A strong drink that I didn’t much care for, but you might enjoy it if you like scotch. This ended up tasting just like a lemonade to me. Nicely flavored without an overabundance of gin. This was a bit light on taste and whiskey on first sip. 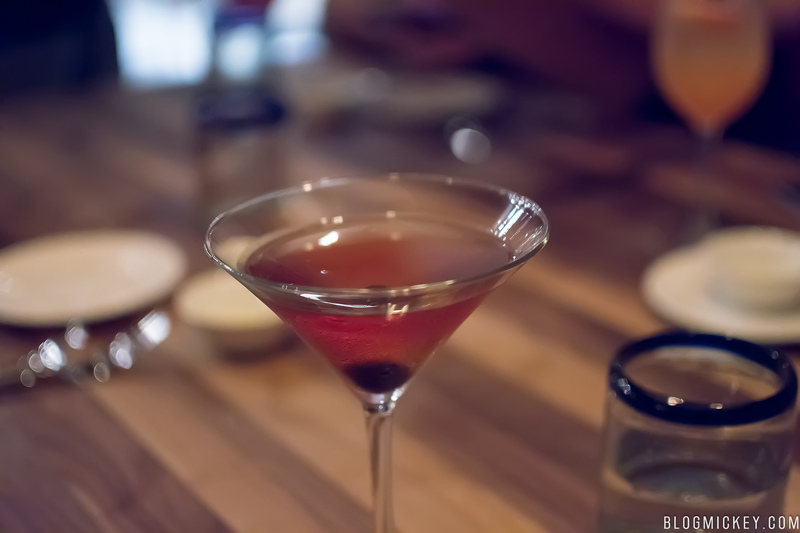 As you progress through the drink, the flavors will become more notable and enjoyable. I’d suggest a good stir to assist with the flavoring when it arrives to your table. On to the meat of the review. A restaurant is nothing without enjoyable food worth spending your money on. Unfortunately, we found the food to be as un-imaginative as the theming. A largely dull offering despite some interesting elements such as a hard-cooked egg. 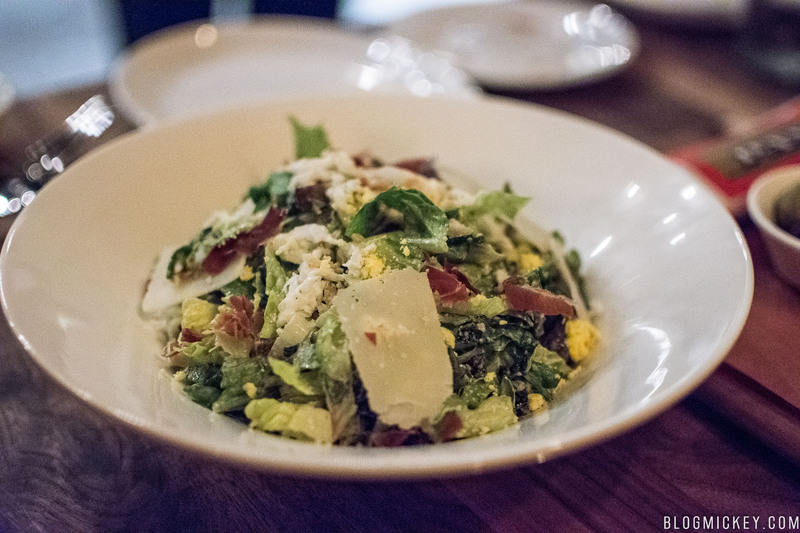 It earns a pass from us, especially if you’re of the impression that it’ll turn out like a traditional caesar salad, which it doesn’t. Possibly the most controversial item of the evening, including the 4 different versions of the same drink served above. Both of the tables ordered this dish, as it looked delicious. 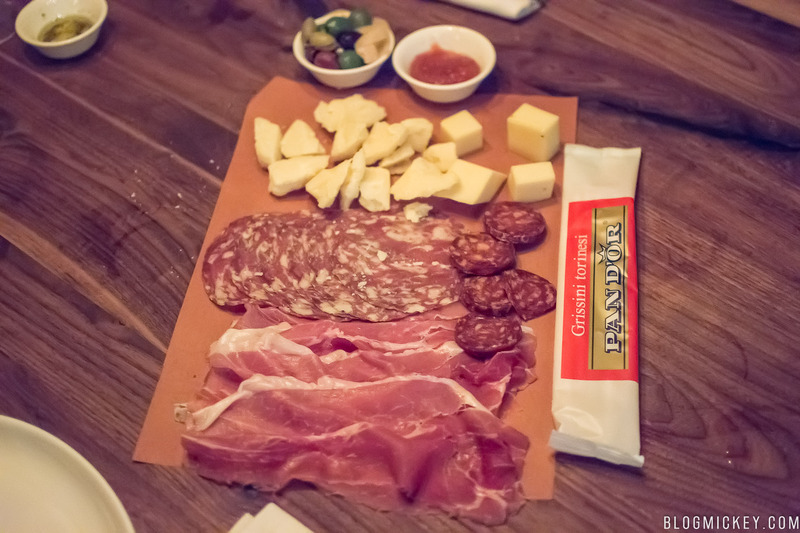 Turns out that it was a truly wonderful offering, with excellent flavors provided by both the meats and cheeses. The table we weren’t sitting at had theirs served just on the butchers paper and table. As you can see in the photo below, that meant that meats slid off of the paper and onto the table. 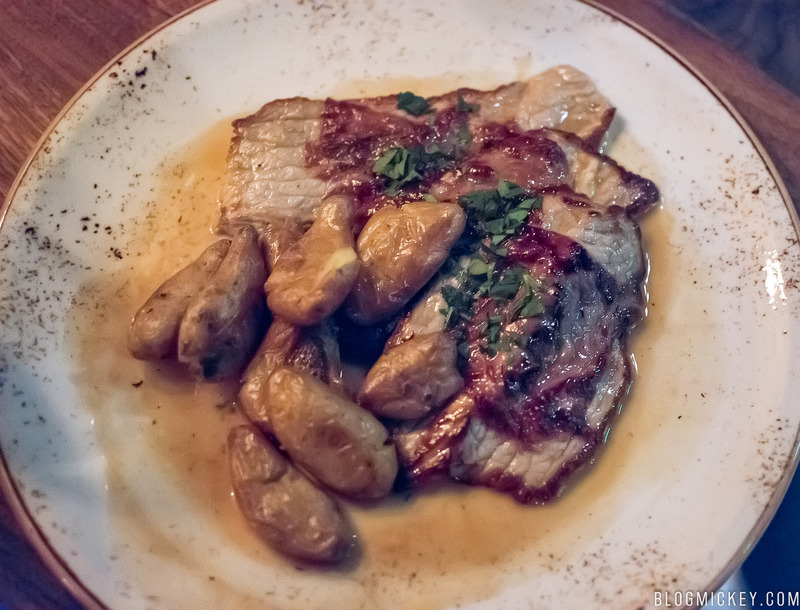 The General Manager of the venue ensured us that it was safe to eat the meats off of the table, and that the chef preferred the dish served in a traditionally Italian style. Luckily, ours was left on the board used to deliver it. The more space we can keep between our food and the table, the better. Hopefully it’s served on a board going forward. As far as flavors were concerned, we immensely enjoyed all of the meats, with the salami piccante sticking out as our favorite. The cheeses were also excellent, with the regginao-parmigiano rising above the rest. This was probably the most disappointing of the appetizers. 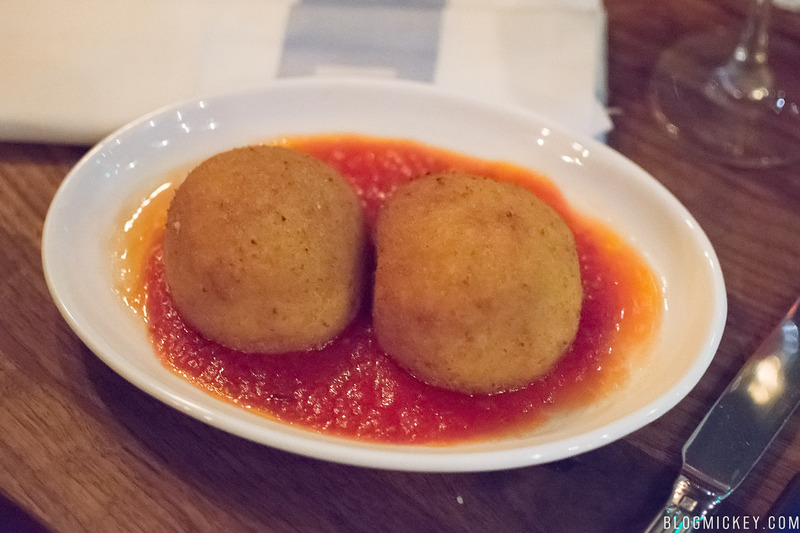 It’s the same as the Arancini served at Maria & Enzo’s, which meant that it lacked any real meat and had an abundance of rice. Let’s start with what we considered the best overall dish of the evening. 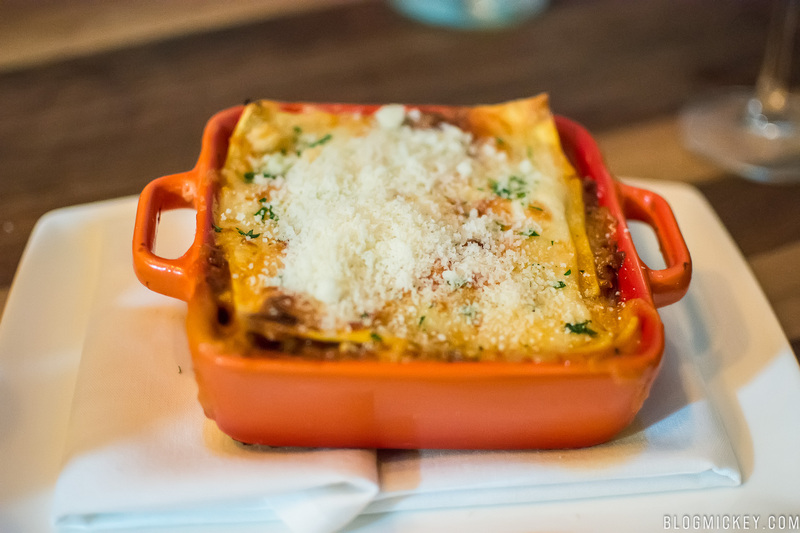 The lasagna hit on all of the traditional aspects of the dish. 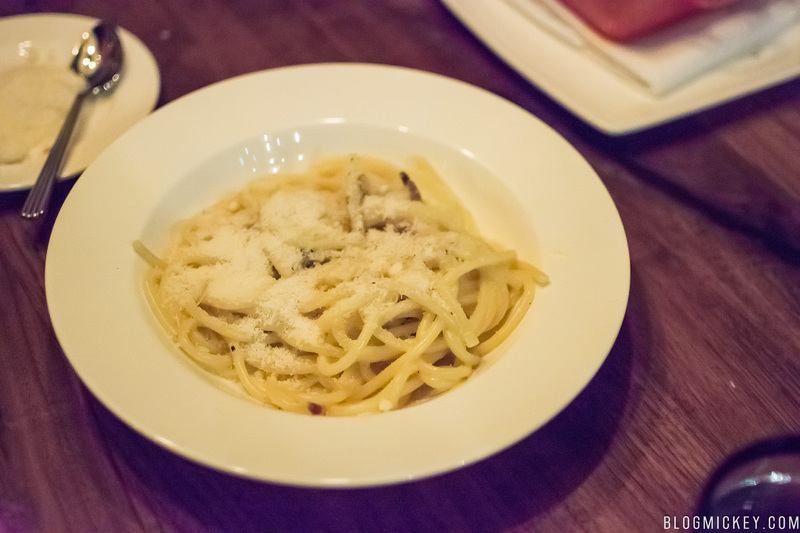 The pasta was perfectly cooked and the meat ragu was enjoyable. Very similar in structure and taste as the N’Casciara Al Forno we enjoyed at Maria & Enzo’s. Easily the most overpriced and disappointing dish of the evening. 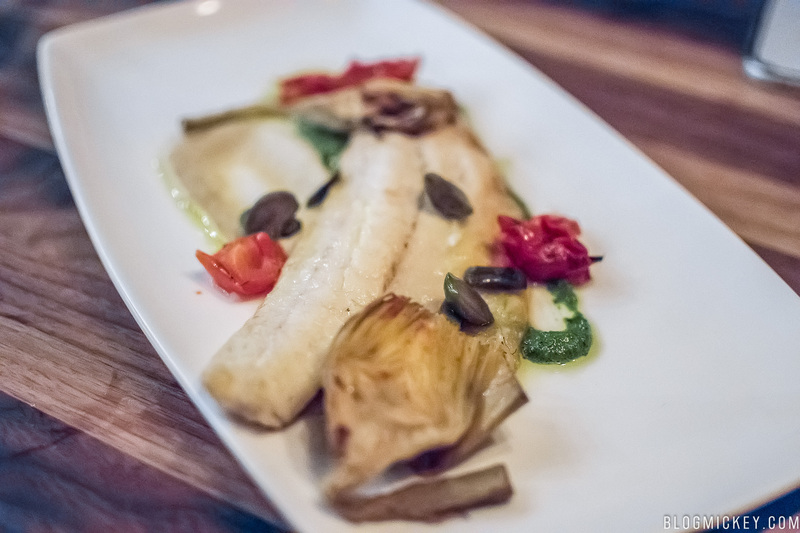 The Branzino, a European Bass, was mushy and bland. On top of that, it was a small portion that I’m not sure anyone will be able to find value in. Another dish that was about $3-5 overpriced. That price spread seems to be consistent across dishes at both Maria & Enzo’s as well as here at Enzo’s Hideaway Tunnel Bar. The pasta was overcooked, although it could be called al dente. Not my liking, but those who like that cooking presentation might enjoy it. Unfortunately, the meat was scarce to non-existent. Out of the 30 or so bites we took to finish the dish, we maybe got a reasonable amount of meat in 4 or 5 of them. Virtually all of the meat can be seen in the photo below, the rest was pasta and a forgettable cream and cheese sauce. Nothing really special here, it’s cheese, pepper, and noodles. Your $23 is better spent elsewhere. 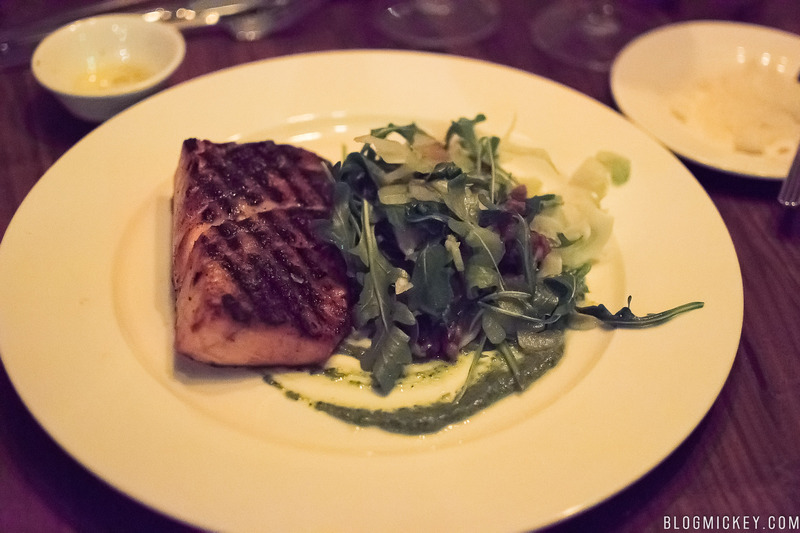 The salmon was prepared well and proved to be a much more enjoyable portion than the Branzino above. It’s worth noting that this isn’t the “salsa verde” as the majority of the world knows it by. It’s pesto. There was a good deal of confusion at our table over the labeling. When you operate a restaurant at a place like Disney Springs and Walt Disney World, it would be prudent for the items to be labeled how the majority of your guests will recognize it. It was eventually explained that this was a “chef’s version” of salsa verde. I think a menu update would be a good idea to further clarify some of the items before the “chef’s version” is ordered. The portion of veal was small and was overcooked. A strongly flavored sauce meant that we couldn’t even find a flavor in the veal. This dish was a complete 180 over the wonderful veal you can find at Maria & Enzo’s. We’d recommend passing on this veal and getting it at Maria & Enzo’s instead. The steak proved to be a bit unimaginative, despite the abundance of ingredients piled on top. The tomato sauce added very little to what amounted to be a fairly standard steak. 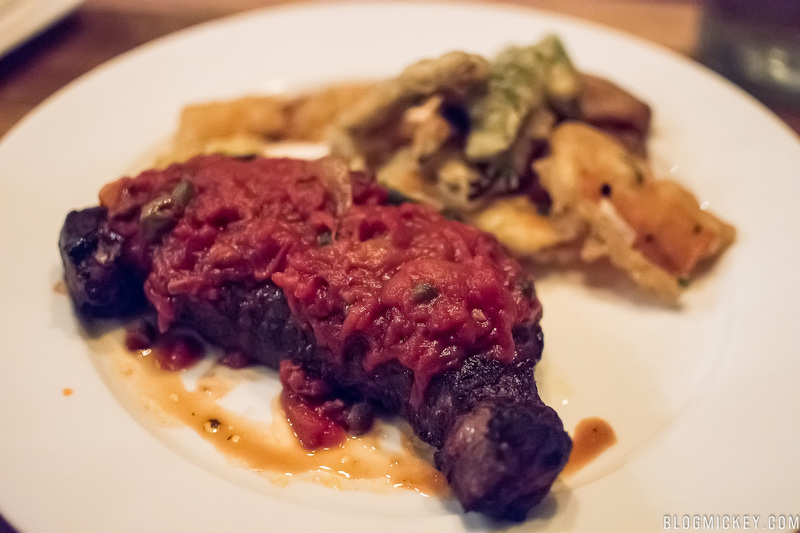 You can do better as far as steak is concerned at Disney Springs. Overall, our food was middle of the road. 5/10. After a bit of disappointment with the first two courses, we passed on desserts. This was where the desire to spend money at this venue broke down. As mentioned above, we had a single drink made three times before we settled on a version. This really can’t happen. I would have rather seen Patina Group delay the opening if they weren’t ready. On top of that, we were never asked if we’d like to order a second round. One drink at our table sat empty for 45 minutes until the meal ended. I also think that one waiter to handle both tables lead to some issues. It isn’t terribly uncommon for at least one more waiter to assist when dealing with such a large group. This is an operational item that Patina Group should be familiar with and able to address going forward. 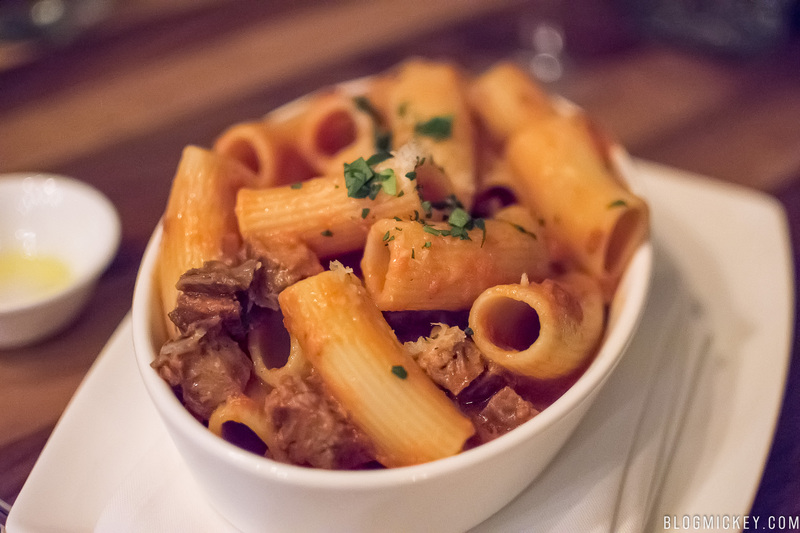 Overall, we were underwhelmed with Enzo’s Hideaway Tunnel Bar and Restaurant. What was once one of the venues at the top of our anticipated restaurant list, has become a venue that we won’t revisit anytime soon. 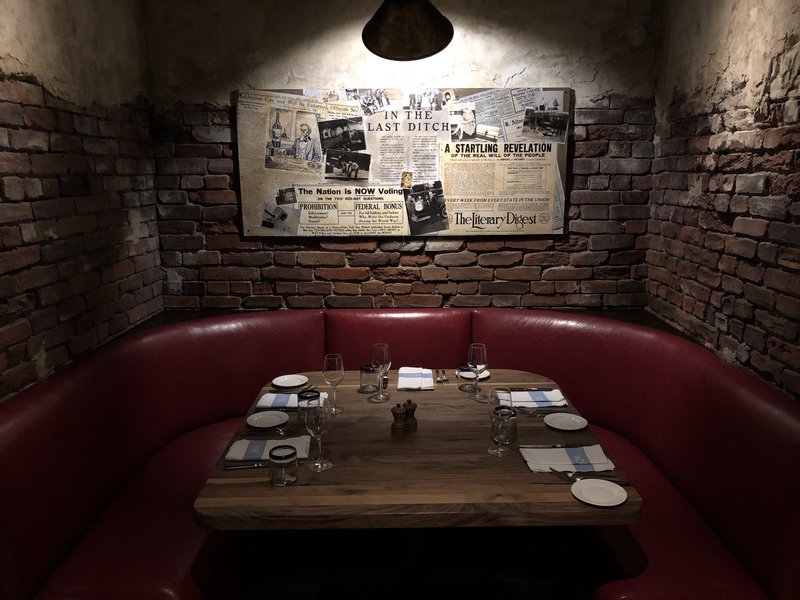 We did visit on their first night of public operation, but with multiple “friends and family” preview meals, and a kitchen that’s delivering quality meals at the other two restaurants, we felt that something is off with Enzo’s Hideaway Tunnel Bar and Restaurant at the moment. 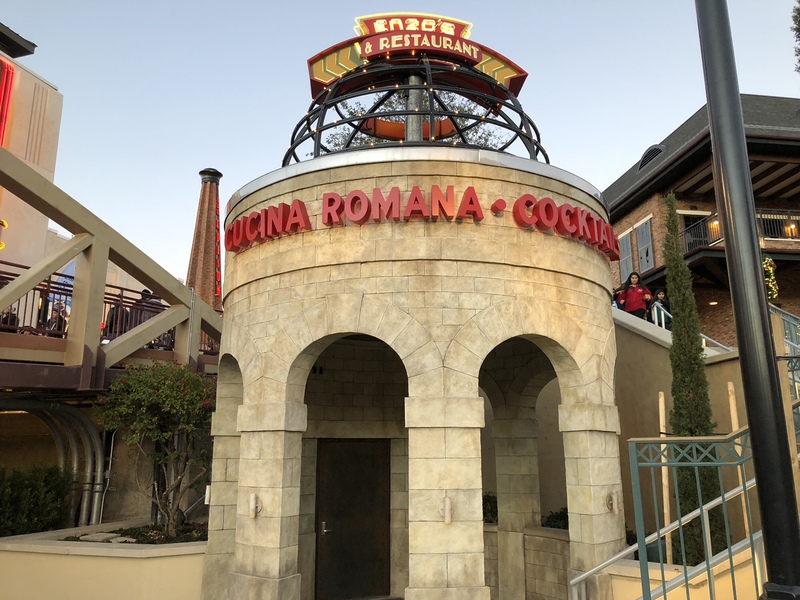 I’d highly suggest The Edison (review coming) or Maria & Enzo’s over Enzo’s Hideaway Tunnel Bar if you’re visiting Disney Springs in the coming months.